Daihonzan Shodoshima Daikannon Bushiji Temple, otherwise Shiawase Kannon( Goddess of Happiness and Mercy), was built with donations from many congregations in Japan. 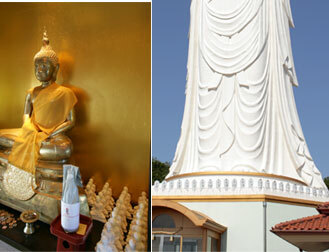 Together with "Tainaibutsu( The sheath-buddha)", "Honzon Shiawase Kannon" and "Junishi-mamori Honzon( Eight Buddhist of the 12 astrogical animals)" we have enshrined "Buddha no Miha( The Sacred Tooth Relic of Buddha) settled by Sri Lanka Bushiji Temple, and Daihonzan Shodoshima Daikannon Bushiji Temple is a sister temple of Sri Lanka Bushiji. 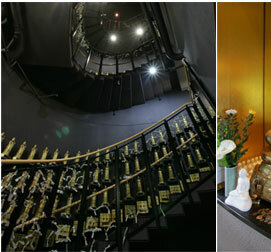 The observation deck of the top floor overlooks the view of the island and the Seto Inland Sea. At visitors’ requests, we provide "Ongaku Seppou","Meisou (Meditation)", "Shiawase Kigan( Prayer for happiness:Goma service) and "Senzo Kuyo( Holding memorial service to ancestor), and in addition worshipers can receive "PIRITH-NULA"( the sacred thread for happiness in Sri Lanka). The appearance of this Daikannon is most beautiful in the world both in name and in reality so that it won at the"ARC + international work contest" held in France. In the precincts, a lot of trees and plants including olive, a well-known product an Shodoshima Island, show the colors of the seasons and the appearance of Buddha is shown by illumination at night and it makes us feel at ease and gives us a comfortable time. As annual event, Higan Houe( Meeting to listen to the Buddhist doctrine held during the equinoctial week) in Spring and Autumn, Flower Festival, Toro-kuyo(Holding a memorial service to garden lantern) in the Bon Festival and Shiawase(happiness) Festival in Autumn are held and worshipers and tourists both from inside and outside of the Island join these festivals consistently. 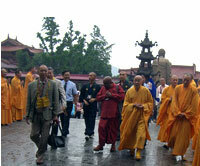 After Buddha's death, Buddha's relics have been kept separately at 8 temples in order to avoid vanishing of time. 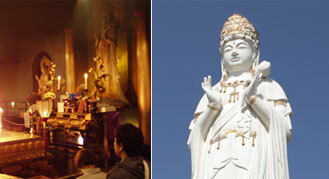 One of them is this Buddha's tooth enshrined in Bushiji Temple. It is officially called "Dalada Maligawa". It is located in Kandy, an ancient city of Sri Lanka, and it is one of 8 temples in which Buddha's relics have been kept separately and also is the temple where many people comes to pray from all over Sri Lanka as the most precious Buddhist temple. The Kandy Perahera held in nighttime in August is particularly famous. After Buddha's death, The Bodhi Tree under which Buddha had become enlightened for defense, preserving and development of Buddhism have been transplanted to Sri Maha Bodhi Temple in Anuradhapura, Sri Lanka. So far the roof of the tree has not been divided yet. 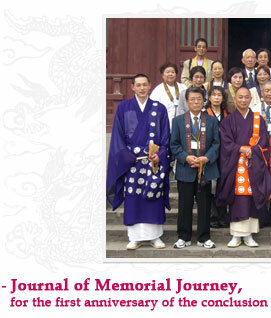 In this memorial journey from June 9th to June 13th (5 days trip), 50 people from congregation and who have various fates joined us. 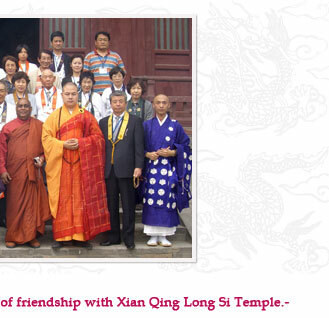 At Xian Qing Long Si Temple, we held a Buddhist service with the high priest, Monk Kuan xu, for the first anniversary of the conclusion of friendship, and held an Arbor Day of seedlings of the olive which is the symbol plant of Shodoshima Island. 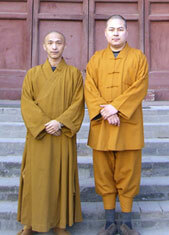 At night, the Xian government held a welcome party for us. 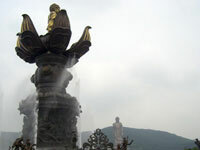 In Wuxi city, we visited the Giant Lingshan Buddha (Xiang Fu Chan Si Temple), high priest, Monk Wu xiang, and his 40 priests welcomed us so much, and then we paid homage at the Buddha as big as Daikannon. After that, they showed us a show of a fountain at precinct outside the show time. We left China, being impressed with the polite reception from the Chinese government. We were thankful that all of us could come back to Japan safely, and we hope more people join the next worship, too. 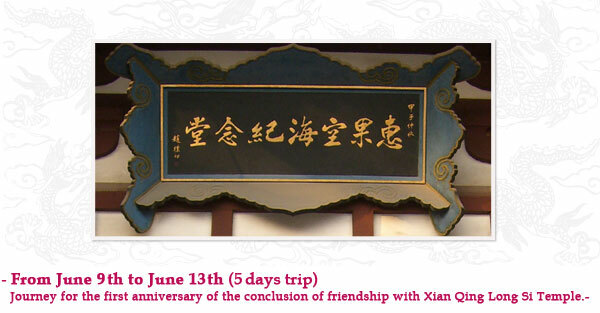 It has passed just one year since we had the conclusion of friendship. 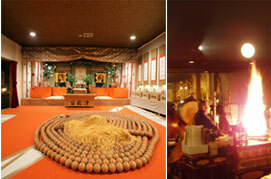 As a memorial event, we planned worship to Xian Qing Long Si Temple which is our friendship temple. 50 people from congregations and who have various fatalities, who have firm belief, joined us and held a Buddhist service at Qing Long Si Temple, and went sightseeing in Xian, Wuxi and Shanghai. 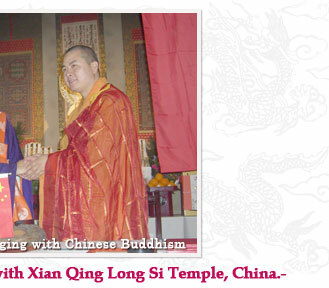 On May 9th 2006, Shodoshima Daikannnon and Xian Qing Long Si Temple,China signed with friendship temples in the presence of Monk Kuan Xu, high priest of Xian Qing Long Si Temple, and of Mr.Wang, a head of the administration of religion. 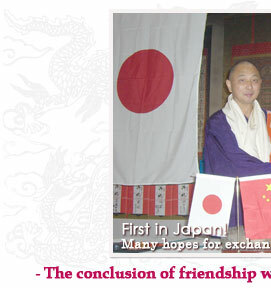 This is also a first conclusion for us in Japan; therefore we appreciate having good exchange with Chinese Buddhism from now on.